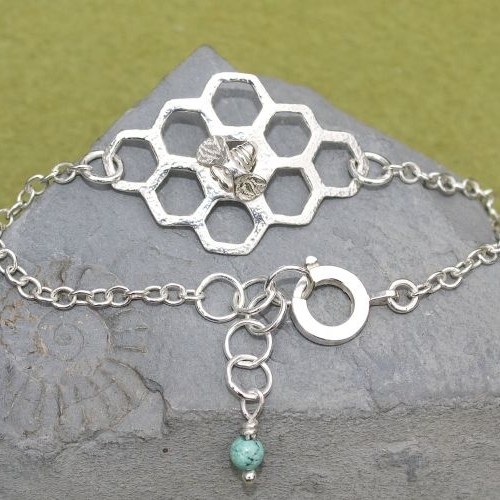 The Sweet Honey & Bee Bracelet is made of solid sterling silver using my sterling silver Honeycomb slice which is slightly curved so it fits the wrist more comfortably, it looks stunning worn alone or can be mixed with other bangles for a contemporary look. The surface of the honeycomb slice has a tiny dimpled texture which catches the light beautifully. 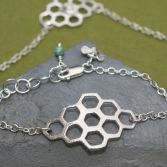 The Sweet Honey Bracelet has a strong trace chain and a contemporary trigger clasp which makes your bracelet extra secure and adds to the contemporary look. 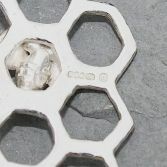 The little silver Bee can be selected as a charm or soldered on top (see images) the honeycomb slice, please select using the options button. 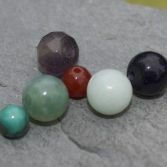 Also select your choice of semi precious bead using drop down. Shown here with a 4mm Turquoise bead. Chose from Blue Goldstone, Red Carnelian, Pale Green Aventurine, Pale Blue Amozonite, Roundel Amethyst or Turquoise. The Sweet Honey bracelet is 7.5 inches long or 19cm long and has extension loops making it suitable for medium to large sized wrist. The bracelet is fully hallmarked at the UK Edinburgh Assay office and all our sterling silver is sourced from reputable UK bullion suppliers. Your Sweet Honey Bracelet will be presented to you in one of our signature gift boxes and will be posted to you via Royal Mail special delivery (signed for) to any UK address free of charge. 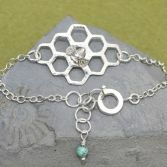 Little Bee Option: As A CharmSoldered Upon The Top.